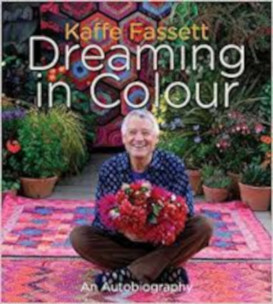 Kaffe Fassett has led an extraordinary life and is a captivating storyteller with a vivid memory. Born in 1937 in San Francisco, he spent much of his youth in Big Sur, where his parents bought a log cabin from Orson Welles and transformed it into the world-famous Nepenthe restaurant, a gathering place of artists of all sorts (Kaffe has many stories to tell about mingling with the likes of Olivia de Havilland, Elizabeth Taylor, and Henry Miller). After attending a boarding school run by the disciples of Krishunamurti, an Indian guru, he studied painting on scholarship at the School of the Museum of Fine Arts in Boston, but left after less than one year and traveled to England, where he ultimately made his home. After struggling to make a living as a fine artist for several years, Fassett met the fashion designer Bill Gibb and began designing knitwear for his collection. He went on to design knitwear for Missoni and for private clients like Lauren Bacall, Shirley MacLaine, and Barbra Streisand, and to revolutionise the hand knitting world with his explosive use of color. Further explorations led him to needlepoint, mosaics, rug-making, yarn and fabric design, set design and quilting. Now in his 70s, Fassett continues to produce new work in his studio in London and to travel worldwide to teach and lecture. This intimate autobiography is lavishly filled with Fassett’s amazing stories about his bohemian childhood, his hard-earned rise to fame, and all of his creative pursuits. It includes photos of him throughout his life (including his stint as a model in Paris), his home (which is an artwork in itself), his work (everything from childhood drawings to pencil sketches, to oil paintings, to massive tapestries and set designs, to hand knits and quilts) as well as the people and places around the world that have inspired him. First published by Stewart, Tabori & Chang (Abrams, US) in 2012.